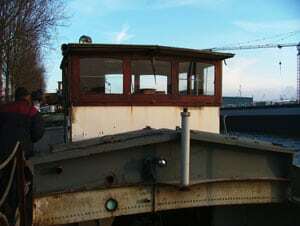 30th January 2006 – Back in Ostend, I sent an e-mail to the shipyard in Terneuzen about shortening the boat and arranging a meeting to talk in detail about this project. One of the annoying things in Sluiskil is no Internet. These days you really need Internet to make things happening! 28th & 29th January 2006 – In the last week, Andy had cleaned the engine room and repaired the central heating; an essential part for the next couple of months! Some paintwork was done to protect the weakest places on the back cabin. The engine was started for the first time and ran for nearly one hour, propeller turning. No smoke came out of the funnel, a good sign or a job well done! We also discussed the option of shortening the boat. It is not an idea, I would like to support, but this ship has a better value in Great Britain, when she’s shorter. 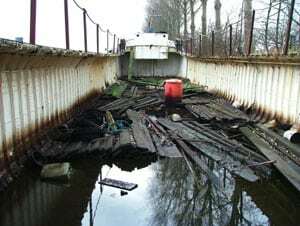 We took a look at the dry-dock facility in Terneuzen and talked with the man of the yard.He didn’t look very positive. 14th & 15th January 2006 – We placed a generator aboard for making power so we could use the tools needed for cleaning. We also got a gas bottle for the heating. We decided to start cleaning the cargo hold. Removing leaves, water and rubbish from the bilges. 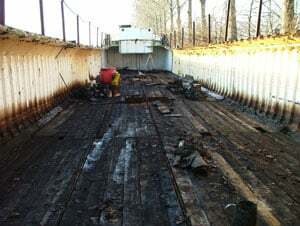 In one day time, most of it was cleaned and with the wooden planks left in the hold, a floor was created. We hadn’t enough for creating the whole floor. A few were missing, but the result looked satisfying. The next day, the wooden floor was cleaned with a high pressure machine. 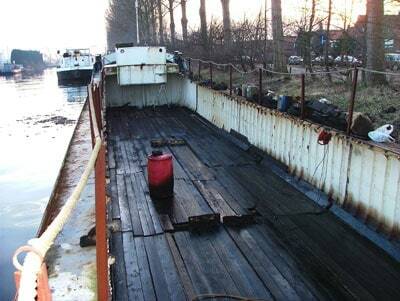 7th January 2006 – Andy made his payment to the yard, so officially the boat became his today. It was a cold day, where I also nearly slipped in the water because of the frozen smog on deck. The first thing he did was hanging the British flag and getting something to eat. With no furniture, we sat on the ground in the back accommodation. I started reading the documents that were left around, such as the River Rhine Certificate, Oil delivery books, some logs, etc… I promised him to do an effort in tracking the history of the ship. 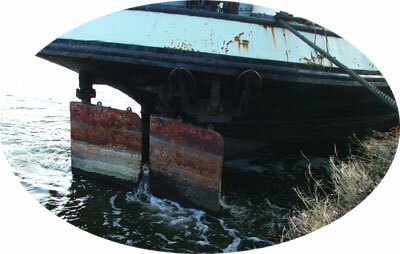 The pictures here show in what state the vessel was. She had no roof over her cargo hold. 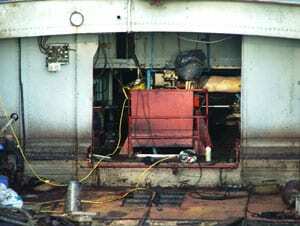 The engine room had flooded and the water was starting to fill the cargo hold as well.